So I was wondering if there's someone else participating in this game-jam because it's been very silent here. This post is here to change that. If you're participating and-or have an idea you'd like to share, then I'm eager to hear it. Actually, even if you're just planing to join the jam I'd like you to speak up. I plan to make a game where you grow herbs and weeds to then sell them and (obviously) to earn money. While you do this very basic task you can extend your farm to reach even higher profit. All this is set in a 16-Bit 2D-Sidescroller world with brightful colours. I was 'umming' and 'aahing' on joining due to time constraints... but your post made me change my mind and jump in head first. With a blindfold. And no helmet. Into an empty pool. So you have made a great accomplishment today, :D.
This is my first ever itch.io jam. I looked for code restrictions and found none, so as mentioned I'll jump in too to help try and spice it up a little. My usual reason for not making game ideas to fruition? Motivation and time spent doing other things or games already made. So this will try to pick up my dev vibe. I plan on making a top-down, sci-fi city builder using HTML, CSS, JS and jQuery. Graphics will be basic. It'll involve countdowns for each building made, and each building will require power. Power will help the buildings slowly accumulate more civilians which generates taxes per second. Eventually you keep building and keep making power. Then you upgrade buildings to make them more efficient. All of this is aimed at earning enough via taxes to continue expanding your city via an expanding grid system that costs increasingly more to purchase. What will spice it up is random events that will require you to make decisions, which influence whether your civilians will like you or not (this will slowly recover on its own), which impacts taxes. I suppose it needs a fail state, so it'll fail when your city's happiness reaches 0%, in which case they infiltrate your missile silos and blow up your house. Or something. I tend to aim high... so let's see how far to completion it gets! Really glad to make you join! Your game idea sounds really fun actually. Hopefully others feel it turns out that way! I'm doing an under water colony building game. The inhabitants will need to be able to make a living for themselves, so you will have to balance their needs with the needs of the growing city as a whole. Sounds neat. Any ideas on mechanics yet? You could go quite deep into them making a living and surviving and two weeks isn't much time depending on the scale. Looking forward to seeing what you make! Yeah, feature creep is hard once the bug bites, ;). I'd trying to avoid it as well... trying. You mean you think it goes for too long? I think it is balanced well. Any plans for winners, runner-ups, etc such as a little banner or icon for their website? Could be a good boost for some indies out there to help spur their motivation, :). Nice! Better jump in, only 13 days or so left, ;). Sorry we're late for the party. 10 days to go. Better get a move on!!! Hey just wanted to chime in here to say that I'm working in a team of two ona project to submit. Good luck everyone! Doing some progress on my mini mobile city sim, got road laying done! I wanted to make a "community" sim where the player balances the needs of the members of a small community. Ended up having to cut out a lot (curse feature creep!) but it looks like I'll at least have something resembling a game by the end of the jam. Pulling out of this jam, two weeks isn't enough time for me coding from scratch (no framework nor engine; coding a web-based city sim) with only two hours a night. I knew it was going to be ambitious and work ramped up to insane levels due to policy changes. 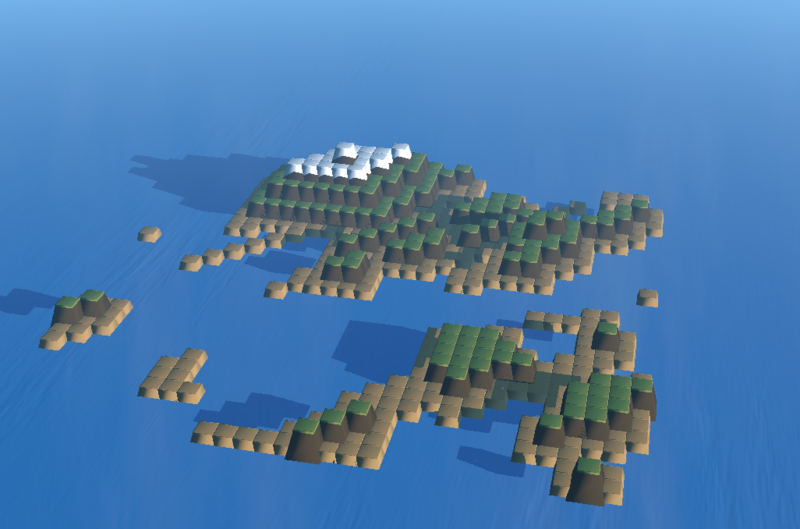 actually, terrain-generation is simpler than SC2000's. Round up the whole thing with buildings made up of tetroid-modules, and connect them via pipelines… hopefully there's a game, somewhere in there.